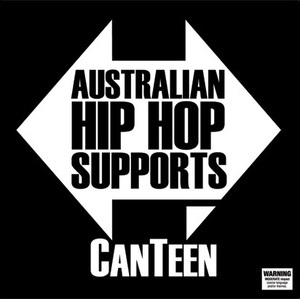 Hunter's new charity cd is available today "Australian Hip Hop Supports CanTeen". 100% of the money goes to CanTeen to help kids with cancer. he would have loved to have seen it released, I'm sure. I hope you can all support it. the lineup is great too, so you'll get a double cd of great music from some of Australia's best hip hop artists - it's so great to see everyone in the hip hop community pulling together to help Hunter and others with cancer. & remember his msg: "As I depart this world with a song in my heart, I just want to say, Love each other! Love will make you happy, Love is the answer to all your questions - I got mad Love!" --HUNTER SBX. I started this project with the best intentions! put together a collection of songs, press up some discs, sell them, give money to charity, that being CanTeen. Easy!, and fun too! turned out not to be so easy, but still heaps of Fun! I was diagnosed with Nueroendocrine cancer in November 2009, and at the time was about 3/4 through making the album 'Monster House' with DJ Vame. Upon diagnosis, they told me it was inoperable, and that they couldn't cure me. This of course changed my life. I finished the album with Vame, and we went on tour, and it was while sitting in a motel room that Vame suggested I used my contacts within Australia's Hip Hop scene to make a compilation album for charity, the idea was born then, and upon completing tour, I got on the case! I contacted all my friends, and told em what I was up to, and most were all to happy to help. I have to mention though, that due to contractual agreements, and timing issues, some were unable to provide a song, but there well wishes were gladly received! Over the journey, I got progressively sicker, and the project would have sunk if it hadn't been for the tireless efforts of Rachel P, Porsah Laine and Dazastah, who more than picked up the slack, actually got the job done! I also got to thank Tracy V and all the crew in Karratha, Paul Salter, Mad shout outs to everyone on the album, all the crew, Rachel, Daz, Porsah Laine, Deej, Tracy and Paul. As I depart this world with a song in my heart, I just want to say, Love each other! Love will make you happy, Love is the answer to all your questions‚Ä¶ I got mad Love!